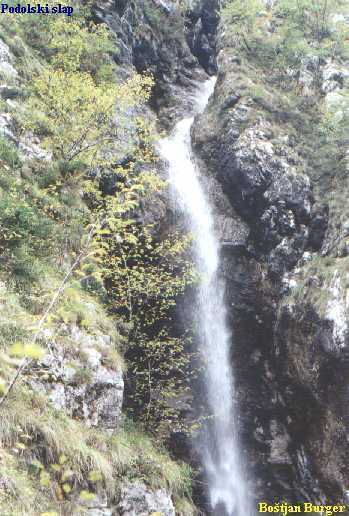 Slap Podolski is one of the highest waterfalls in Slovenia and is situated north of the town Trenta. The rover Podolski drops down over an impressive 110 meters before it ends in the river Soca. When driving north from Trenta over road 206 to Gransjka Gora you will see Slap Podolski on the left side just after camping Trenta. The gorge where river Podolski flows is called “Po dolu”. Here you can find several waterfalls. The highest one is the lower fall, slap Podolski. Furher up there must be another nice fall with a drop of 40 meters which ends in an emerald pool. P.s. Podolski is a famous German/Polish soccer player. When searching for pictures you will see a lot of soccer players….